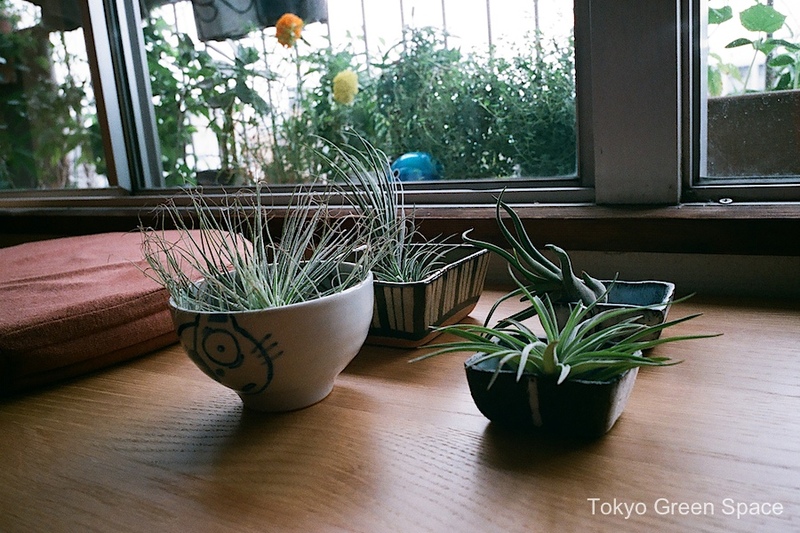 Easy to move around, the tiny scale of air plants are a perfect fit for a Tokyo apartment. 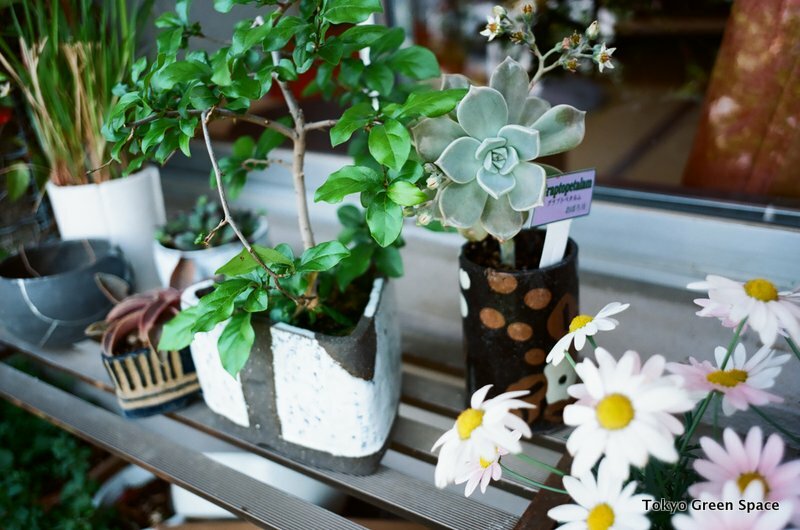 I made the bonsai pots on the right at Kuge Crafts. The cat drawing on the left is by Shu. This persimmon bonsai has been very easy to care for, and this year I’ve pulled two branches down to the base of the trunk, creating a circular shape. Above is how it looks now at the verge of summer. Below, new leaves pushing out in March. I was a little sad that this red pepper never grew past mini-size. But its the perfect size for this bonsai pot that I also use for air plants. This plum bonsai is part of a tiny but incredibly abundant garden also on the way to Nakano station. This gardener clearly knows about plants and seasons. Because almost all his plants are in pots, they can be moved around for maximum enjoyment. 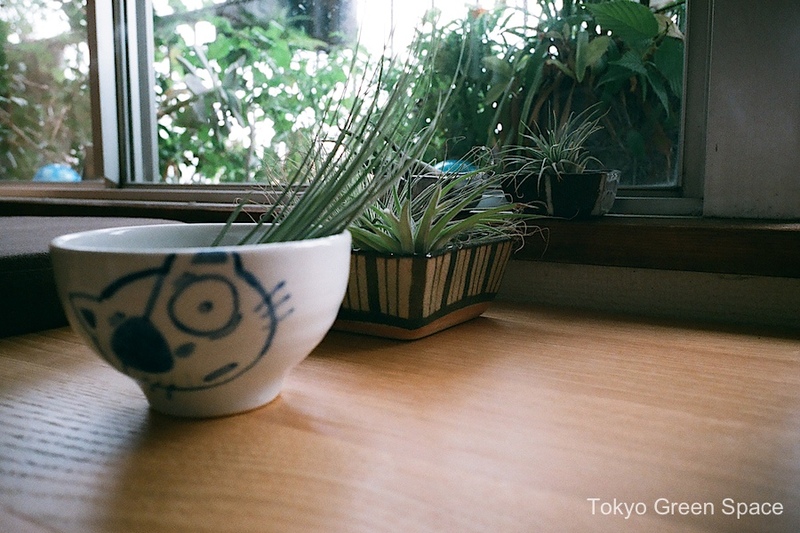 These photos are from the Shiho ceramic show last month. 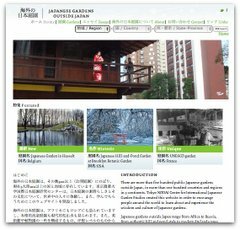 I exhibited bonsai pots, regular pots, and wall vases. I like white glaze on black and red clay because it seems earthy and neutral. Next year I want to make more bonsai pots, and use them with air plants. Preparing for the Shiho student show last month, I wondered how to show off the bonsai pots I made this year. I tried one with only gravel, and another with a tiny succulent. My favorite is perhaps the oddest combination: air plants. I like their shapes and their distant origins in a different climate. And I like how you can easily take them out and examine the pot. What do you think about this combination? Native to Persia (what is now Iran), pomegranates remind me of the Mediterranean. I was surprised to see a neighbor’s pomegranate tree full of fruit. I guess the neighbor is not eating them, since they are bursting open. The birds are probably happy to eat the delicious seeds, and then distribute them as they travel. Last year I also took photos of neighborhood fruit trees, including a miniature pomegranate. 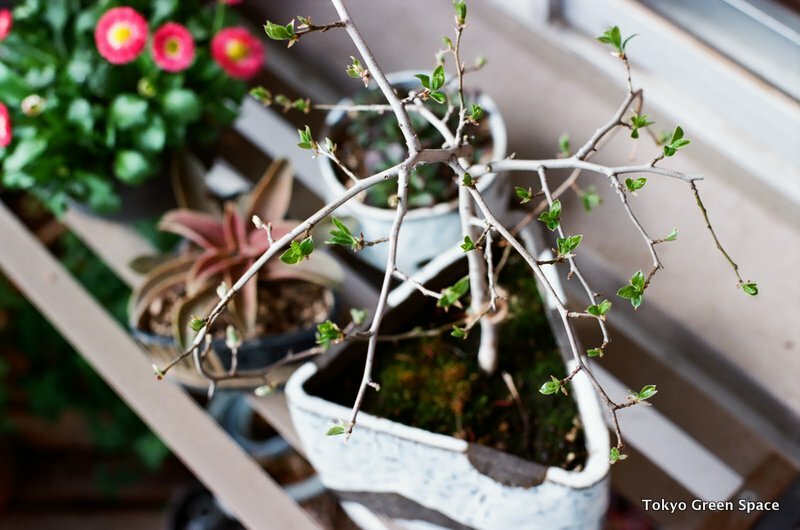 There are special varieties used in bonsai making.